In 1950, three XK120 Jaguar sports cars were entered in the Le Mans 24 hour race, when one retired, and the other two came in twelfth and fifteenth position. Following this result, it became obvious that the car would never be sufficiently competitive against pure sports racing cars. Accordingly, work began to further develop the XK120 chassis and engine to produce a competition model with which to return to Le Mans the following year. The new lightweight variant was to be designated the XK120C sports car, where "C" referred to competition. What was needed was a body more aerodynamically efficient than that of the XK120, but yet still retained an external similarity. In order to reduce weight, the heavy "120" chassis was to be replaced by a tubular space frame unit, with sub frames to support the engine and suspension. The centre section, containing the two seats, was extensively braced. The original front suspension was retained, but the rear suspension was considerable modified, with the semi elliptical springs being replaced by a torsion bar assembly. The existing re-circulating ball steering was replaced by rack and pinion. Both these changes represented a first for Jaguar cars at that time. The C-Types mechanical components came exclusively from the "120". All non essential items, such as carpets, hoods, and external door handles, were removed in order to reduce weight. 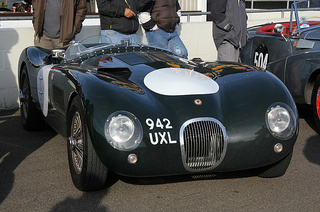 In the end, the weight of the C-Type was reduced by 1,000 pounds compared with that of the "120". From 1952, disc brakes were added all round. The C-Types aluminium body was constructed in the barchetta style (a style of open 2 seater sports car, built for racing, in which weight and wind resistance were minimised to maximise performance). One downside of this body styling was that it created a huge tail lift, which caused the car to snake at high speeds. 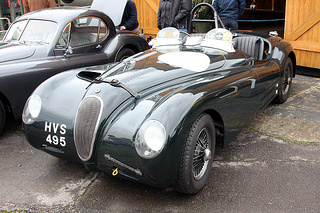 The XK120C was to be powered by a standard 3.4 litre, 6-cylinder XK engine, with a compression ratio of 9.0:1, and linked to a four speed Moss gearbox, with the wet sump lubrication system and two SU carburettors being retained. However, modifications were made to the inlet port and exhaust system, whilst high lift camshafts and a lighter flywheel were fitted. Wooden mock-ups were wind tunnel tested to produce a car with sleek, flowing lines that was now referred to as the C-Type Jaguar sports car. Of the early XK120's, 240 were built with aluminium bodies, and the use of aluminium panels would continue in the C-Type's construction. 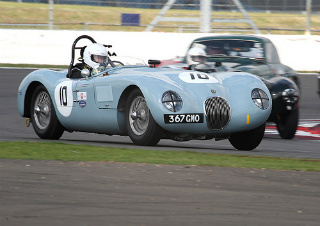 The first C-Type sports car, with chassis number XKC001, was tested at Silverstone, and the three car works team was then entered in the 1951 Le Mans race. The unknown 3.4 litre C-Type was on the grid with 4.5 litre Talbots, Ferraris, Aston Martins, and a 5.4 litre Cunningham. In the end, two of the three C-Types had to retire, but Jaguar XKC003 drove on to victory, and covered the 2,244 miles at an average speed of 93.5 mph. Prior to this win, Jaguar cars was a relatively unknown entity, but afterwards, the name was known worldwide. 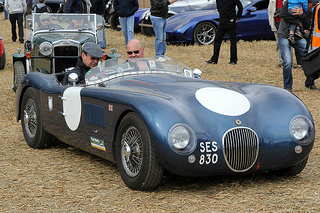 Building on this success, the same three works C-Types were entered in the Tourist Trophy race in Ireland, and finished first, second, and fourth and took the team prize. 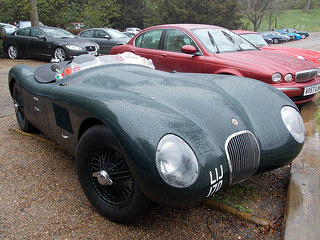 Jaguar went on to win the 1953 Le Mans with the C-Type. 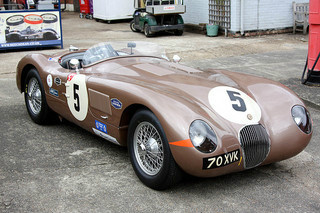 After their Le Mans victory, Jaguar planned to sell the 53 C-Types produced between 1951 and 1953, and built to resemble the works cars, as a production race car. Each was offered at £1,500 plus tax. In fact, one of the conditions for entry at Le Mans was that at least 50 units of the car to be entered were required to have been manufactured prior to the race. 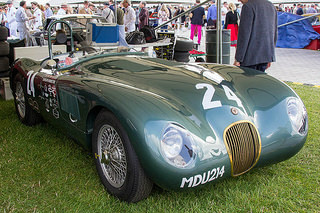 When the C-Type won the 1953 Le Mans, the body used thinner and therefore lighter aluminium panels, and instead of the original two H8 SU carburettors, three twin choke Webber DC03 carburettors were used and, with high lift camshafts, caused output to be increased to 220 bhp. The last time the car was entered at Le Mans was in 1954, when it came in fourth. 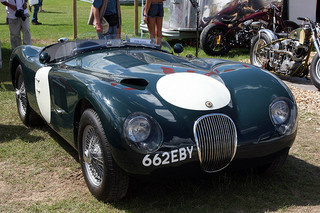 The original cost of a C-Type Jaguar sports car was around $6,000, nearly double that of the XK120. In terms of the second hand market, an original example in good condition would command around £400,000, whilst a replica would fetch from £40,000. On the other hand, the 1953 Le Mans winner would be worth around £2 million. In fact, in 2007, an example in showroom condition that had been raced by Phil Hill sold at auction in the US for $2.53 million. In the line-up of Jaguar cars, the C-Type deserves the accolade of a true classic car. A 1951-53 Original Jaguar C-Type, in excellent condition, would command in the region of £80,000/$125,000, whilst a similar replica example would fetch around £50,000/$85,000.